This lamp shown here in Oak has distinctive fluting for its column and a multi-tiered beaded base. It comes in two sizes 16" and 48" measured from the base to the start of the socket. This lamp makes a perfect addition to the Portland Desk. A matching floor lamp model is available. Note, all lamps use UL/CSA approved parts. All lamps come with either 8 or 10 foot cords instead of the typical 6 foot cord and have three way sockets with solid brass shells. 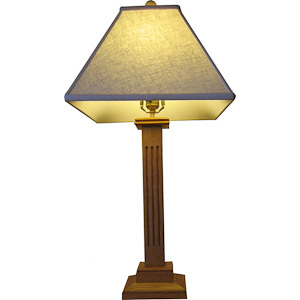 This lamp is shown with a rectangular linen shade from Silk-O-Lite (Note: Shades are not included and shown as an example only). You supply your own shade and finial to suit your personal taste. Note: WOOD types are Oak, Maple, Cherry, Walnut or Tiger Maple.